Events of 2012 and early 2013 have complicated the commercial fossil trade worldwide, opening the eyes of many dealers and buyers as to what has been appropriate to buy and sell for at least the last two decades. Assumptions were made that because no government or governmental agency seemed interested in the sale of fossil material from China and Mongolia, surely it must be legal to buy and sell. Skulls, bones and complete skeletons have been available for over a decade at trade shows, on eBay, and at large, well-known auction houses such as Butterfields, Christies, and Heritage Auctions. The latter conducted large public auctions. A number of major museums sent representatives to many of these events to purchase specimens for their collections and displays. The fossil market in the United States has been flooded with dinosaurs and eggs from Mongolia, feathered dinosaurs and fossil mammals from China, and fossil fish and pterosaurs from the Santana formation of Brazil. These items can still be found at many of the mineral and fossil shows held around the country. On occasion, it was quietly discussed that there were bans on the export of all of this material, but no one was aware of specific laws regarding the export of fossils from any particular country. Rumors were plentiful and misinformation was abundant, with statements such as "It was legal to export before 2000." or "The import ban did not start until 2002". This was, unfortunately, all hearsay, without any documentation to back it up. 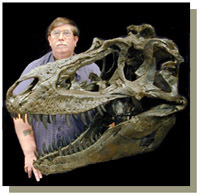 This issue became front-page news when an auction of a Tarbosaurus skeleton took place at the New York City branch of Heritage Auction House on May 20, 2012. The skeleton and auction had been widely advertised. Ultimately, the president of Mongolia filed issue regarding the auction. As a result, the United Sates government stepped in and seized the skeleton before the winning bidder could take possession of it. This incident brought the Mongolian government's laws regarding fossils more clearly to light, and many became aware for the first time, that since 1924, all Mongolian fossils have been considered property of the state. No private collecting was allowed, and no specimens were to have been taken from the country without special permission from the government. This early law was written when the Mongolian People's Republic was formed under Soviet influence. After the breakdown of communism in late 1989, Mongolia saw a democratic revolution in early 1990, which led to a multi-party system, and a new constitution in 1992. However, the same basic law regarding state ownership of cultural items was adopted by each of the succeeding political powers. Mongolia classifies all fossils as cultural items. The Mongolian law is basic and vague, but it is enough to prevent any fossils from legally leaving the country. Therefore, unless special permission was obtained from the government, all Mongolian fossil specimens brought into the United States since 1924, were smuggled out of Mongolia. Some museums such as the American Museum of Natural History, which sponsors expeditions to Mongolia, have permission to collect and remove specimens for scientific study, but the specimens remain the property of Mongolia and will be returned to the country at some agreed upon time. Obtaining information on any country's laws and regulations regarding fossil collecting, sales and export, has been a frustrating endeavor. In most cases, there is no single agency for any country that has all of the correct information available. Acquiring a complete list of regulations may involve contacting customs, multiple ministry offices, and local officials. Their answers and the information received are often conflicting; with one entity claiming something is legal and another stating just the opposite. Most of the foreign agencies I have contacted cannot quote their current laws, or supply the actual documentation defining them. Matters are made worse when corrupt customs agents, who may gladly sign export forms for a fee, give the false impression that it is legal to transport specimens out of a country where it is not. Obviously, fossil laws and regulations affect students and researchers as well as anyone else interested in fossil collecting. As embarrassing as it would be for a public museum to hold a specimen in their collections that was transported from a country where such removal is illegal, it could also be financially devastating to the museum, and certainly to a dealer or a private collector, if that specimen were to be confiscated by a government authority, let alone the possibility of facing criminal charges, as well. In the United States, documentation is much easier to locate with a little research. Still, many fossil enthusiasts are uninformed regarding what is legal to collect, where it is legal to collect, and if it is legal to sell what is collected. Documentation of all international and domestic fossil laws pertaining to collecting, export, import and sales, should be published in English and made available to everyone interested in paleontology. Fortunately for natural history buffs, during 1997, a book titled, "Collecting the Natural World" was written by Dr. Donald Wolberg and his late wife, Patsy Reinard. The book is a wonderful reference regarding fossils, minerals, endangered and protected species, plants and cultural items found throughout the United States. Laws are quoted, permitting procedures and proper state and federal contacts are listed. The book is now out of print, but used copies can occasionally be found on eBay and Amazon.com for less than twenty dollars. If you would like a new copy, Dr. Wolberg still has a few available. You can contact him directly at aragonite@msn.com. The book's six chapters cover state and federal laws pertaining to collecting in all 50 states. This work should be in every natural history and fossil enthusiast's library. Dr. Ken Carpenter and I are working with Don to update his book, which will include a new chapter on international fossil laws. This new section will also be available here on the AAPS Journal website. Stay tuned for updates.